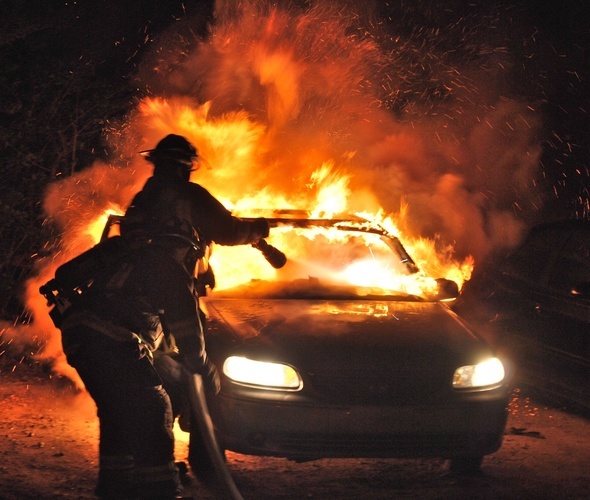 Firefighters work to put out one of four car fires that occurred early Saturday morning near the University of Michigan campus in Ann Arbor. All fires occurred on the S. Forest Avenue and Church Street area of the city. Investigators say four cars appear to have been intentionally set on fire overnight in Ann Arbor - exactly two weeks after another set of suspicious fires, including one that resulted in the death of a 22-year-old student. A reward of up to $5,000 is now being offered to help solve the cases. All the fires occurred in the area of the University of Michigan's Central Campus, and one man suffered a burn to his arm attempting to extinguish a car on fire, officials said. He is being credited with stopping the fire from spreading to a nearby sorority house. All told, eight cars were damaged. Ann Arbor Fire Battalion Chief Robert Vogel said the series of fires occurred within about 20 minutes and spanned several blocks. 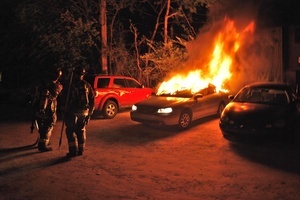 In one instance, a car burned early today in the exact same lot as one of the car fires two weeks ago, officials said. Ann Arbor Police Detective Lt. Mark St. Amour declined to say whether investigators believe the fires two weeks ago and those overnight may be linked. "It's under investigation at this point," St. Amour said. Vogel said firefighters were called to a car fire on South Forest Avenue at 1:45 a.m. They arrived to find a pickup truck on fire at 722 S. Forest, and bystanders pointed out another car on fire at 736 S. Forest, Vogel said. Two weeks ago, a series of suspicious fires also occurred - including this one in the 900 block of South State Street that resulted in the death of a 22-year-old man. The pickup truck was parked next to a sorority, and a man used a garden hose and extinguishers to keep the fire from spreading, Vogel said. He suffered an arm burn in the process, but Vogel did not have information on whether he was hospitalized. "The students were really great last night," Vogel said. "That young man saved that house from burning." At 736 S. Forest, the car that started on fire also burned the cars on either side, Vogel said. The two addresses are about 100 yards apart. Police and firefighters continue to investigate the cause of the fires. Another series of fires occurred in the same area two weeks ago. While firefighters were on the scene, a bystander flagged them down to report another vehicle fire in the 900 block of Church Street, next to the same building where three cars parked below the building were damaged two weeks ago, Vogel said. In this case, the vehicle wasn't under the building. An SUV burned there, and also caught the car next to it on fire, Vogel said. Firefighters soon received reports of another car fire in the area of Oakland and Church streets. That vehicle was engulfed in flames when firefighters got there, and the car next to it burned, Vogel said. Finally, firefighters doused a trash fire on Church Street. No structures were damaged in any of the fires, Vogel said. "We're definitely concerned," Vogel said of the fires. "We set up a command center and have been working with police." U-M student Tatiana Imamura lives on Church Street and said she was falling asleep when she heard sirens and a boom. She said she and her roommate looked outside and saw a car on fire. Matt Feinstein, another U-M student who lives nearby, said he saw a white BMW SUV on fire in the parking lot of the Abbey apartment building on Church Street. He said the car on fire was in the same lot as one of the fires two weeks ago. Roommates Dan Schweber and Adam Lamm, U-M students who live on South Forest Avenue, said they smelled smoke and heard sirens early this morning. They looked out the window and saw the women in the sorority house across the street being evacuated. They said the car was in the sorority’s parking lot and not visible, but they went outside and decided to follow fire trucks nearby. They said they saw firefighters hosing down a vehicle near Church and Oakland streets. “The car was completely trashed,” Schweber said. Nearby, the two said they saw a car on fire in the Abbey apartment building lot, which they said was not as bad as the other vehicles. St. Amour said police are assisting the fire department in the investigation, and two detectives who are trained fire investigators are involved. He referred further questions to the fire department. This morning, the University of Michigan Department of Public Safety issued a crime alert warning the campus of the suspicious fires. The alert says no suspects have been identified. On April 3, several fires started overnight, including one that gutted a home on South State Street, one that burned three cars on Church Street and others that involved trash. The South State Street blaze killed 22-year-old Renden LeMaster and injured two others. Samples from the porch, where the fire appears to have started, were sent to the state police crime lab for analysis, but results are not yet available, police said. Although officials have not said those fires are arson, the U-M Department of Public Safety also issued a warning that day, urging students to be careful and report suspicious activity to police. The reward of up to $5,000 is being offered by the Michigan Arson Prevention Committee. Anyone with information is asked to call 1-800-44-ARSON. Erica Hobbs also contributed to this report.